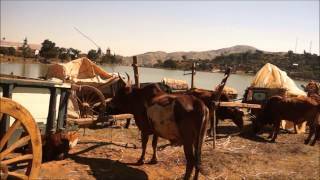 S -19° 49' 59" and E 46° 50' 59"
Betafo in Vakinankaratra Region with it's 29,785 citizens is a place in Madagascar about 78 mi (or 125 km) south-west of Antananarivo, the country's capital city. Current time in Betafo is now 02:35 AM (Friday). The local timezone is named Indian / Antananarivo with an UTC offset of 3 hours. We know of 8 airports near Betafo. The closest airport in Madagascar is Antsirabe Airport in a distance of 14 mi (or 22 km), East. Besides the airports, there are other travel options available (check left side). While being here, you might want to pay a visit to some of the following locations: Antsirabe, Ambatofinandrahana, Ambositra, Miarinarivo and Andramasina. To further explore this place, just scroll down and browse the available info. Let's start with some photos from the area. www.madagascarica.com BETAFO . Située sur les rives du lac Tatamarina, Betafo s'anime tout particulièrement le lundi lorsque le marché s'installe sur la place centrale. Commune urbaine malgache,. Madagascar, officially the Republic of Madagascar and previously known as the Malagasy Republic, is an island country in the Indian Ocean, off the southeastern coast of Africa. The nation comprises the island of Madagascar (the fourth-largest island in the world), as well as numerous smaller peripheral islands. Located at -20, 47 (Lat. / Lng. ), about 15 miles away. Madagascar is an island in the Indian Ocean off the eastern coast of southern Africa, east of Mozambique. It is the fourth largest island in the world. The highest point is Maromokotro, in the Tsaratanana Massif region in the north of the island, at 2,876 metres . The capital Antananarivo is in the Hauts Plateaux near the centre of the island. It has a total area of 587,040 square kilometres with 581,540 square kilometres of land and 5,500 square kilometres of water. Westminster School is an independent, Uniting Church, Early Learning to Year 12, coeducational, day and boarding school located at Marion, South Australia, 12 km south of Adelaide. Founded as a Methodist day and boarding school for boys, the school was opened by the Prime Minister Robert Menzies in 1961 and is named after Westminster School in London. The school became co-educational in 1978, and has a current enrolment of over 1200 students. Located at -20.0002, 47 (Lat. / Lng. ), about 15 miles away. Lake Tritriva is a volcanic lake in southwest-central Madagascar, in the region of Vàkinankàratra, located near the village of Belazao. The lake fills an extinct crater in a region notable also for the presence of many hot springs. It sits in the vent of an oval volcanic cone enclosed in vertical gneiss cliffs. The lake's water level drops during the rainy season and rises when the monsoon rains have ceased. Tritriva was drawn to the attention of the larger world by James Sibree, Jr. in 1885. Located at -19.929, 46.9247 (Lat. / Lng. ), about 8 miles away. Mangatano or Mangarano is a town and commune in Madagascar. 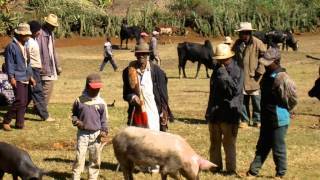 It belongs to the district of Antsirabe II, which is a part of Vakinankaratra Region. The population of the commune was estimated to be approximately 8,000 in 2001 commune census. Primary and junior level secondary education are available in town. The majority 95% of the population of the commune are farmers, while an additional 5% receives their livelihood from raising livestock. Located at -19.95, 46.9667 (Lat. / Lng. ), about 11 miles away. Belazao is a town and commune in Madagascar. It belongs to the district of Antsirabe II, which is a part of Vakinankaratra Region. The population of the commune was estimated to be approximately 11,000 in 2001 commune census. Belazao is located near the lake Tritriva. Primary and junior level secondary education are available in town. The majority 85% of the population of the commune are farmers, while an additional 15% receives their livelihood from raising livestock. Located at -19.8833, 46.9667 (Lat. / Lng. ), about 8 miles away. Antsotso or Antsoso is a town and commune in Madagascar. It belongs to the district of Betafo, which is a part of Vakinankaratra Region. The population of the commune was estimated to be approximately 15,000 in 2001 commune census. Only primary schooling is available. The majority 92% of the population of the commune are farmers, while an additional 8% receives their livelihood from raising livestock. The most important crop is rice, while other important products are maize, potatoes and soya. Located at -19.8167, 46.8667 (Lat. / Lng. ), about 2 miles away. Alakamisy Antivato is a town and commune in Madagascar. It belongs to the district of Betafo, which is a part of Vakinankaratra region. The population of the commune was estimated to be approximately 9,000 in 2001 commune census. Primary and junior level secondary education are available in town. The majority 90% of the population of the commune are farmers, while an additional 10% receives their livelihood from raising livestock. Located at -19.8833, 46.9 (Lat. / Lng. ), about 5 miles away. Ambatonikonilahy is a town and commune in Madagascar. It belongs to the district of Betafo, which is a part of Vakinankaratra Region. The population of the commune was estimated to be approximately 18,000 in 2001 commune census. Only primary schooling is available. The majority 85% of the population of the commune are farmers, while an additional 15% receives their livelihood from raising livestock. Located at -19.7167, 46.9333 (Lat. / Lng. ), about 10 miles away. Mahaiza is a town and commune in Madagascar. It belongs to the district of Betafo, which is a part of Vakinankaratra Region. The population of the commune was estimated to be approximately 18,000 in 2001 commune census. Primary and junior level secondary education are available in town. The majority 98% of the population of the commune are farmers, while an additional 2% receives their livelihood from raising livestock. Located at -19.9, 46.8167 (Lat. / Lng. ), about 5 miles away. Soavina is a town and commune in Madagascar. It belongs to the district of Betafo, which is a part of Vakinankaratra Region. The population of the commune was estimated to be approximately 20,000 in 2001 commune census. Primary and junior level secondary education are available in town. The majority 75% of the population of the commune are farmers, while an additional 25% receives their livelihood from raising livestock. Located at -19.8, 46.7333 (Lat. / Lng. ), about 8 miles away. Tritriva is a town and commune in Madagascar. It belongs to the district of Betafo, which is a part of Vakinankaratra Region in Antananarivo Province. The population of the commune was estimated to be approximately 17,000 in 2001 commune census. Only primary schooling is available. The majority 90% of the population of the commune are farmers, while an additional 10% receives their livelihood from raising livestock. Located at -19.9167, 46.9333 (Lat. / Lng. ), about 8 miles away. Betafo is a district in Vakinankaratra Region, Madagascar. The administrative centre of the district is the town of Betafo. In 2001, the district had an estimated 301,671 inhabitants. The district is divided into 18 communes. The irrigated rice paddies of the district are emblematic of this technology throughout the highlands and were nominated to the Tentative List of UNESCO World Heritage Sites in Madagascar in 1997. Located at -19.84, 46.855 (Lat. / Lng. ), about 1 miles away. These are some bigger and more relevant cities in the wider vivinity of Betafo.